Now, lets talk shooting VR. An app is being developed for Android to convert standard phone pictures into VR and this could make VR as accessible to everyone as was done with traditional filmmaking. Matter of fact… The iPhone 6S shoots in 4k (a $600 4K camera… Wow), that’s how accessible filmmaking has become. However, when it comes to VR, we’re still in the infancy of the medium, therefore specific virtual reality equipment will be the way to go. First gear: To go back to the New York Times story, “The Displaced”, they used eight cameras to shoot 360°. If you’re one to stick to Google, you’ll need Jump. (see above). 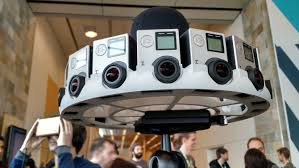 It’s basically a circular camera rig conceived with Hero4 GoPro cameras. It can hold 16 of them, and has an internal software that puts all the images together in 4k quality. It’s not available commercially. But you can try and knock on Google’s door, they might agree to lend you one. Serious. See for yourself. Nokia is about to launch a fantastic camera called OZO. 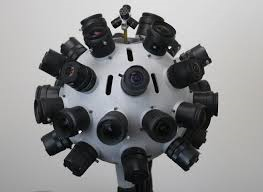 It’s about the size of a tennis ball, has 8 cameras and 8 mikes to capture spatial audio. The price hasn’t been announced yet, but it’s expected to be in the 5-figure range. In the meantime you can admire it on their website. This being said, GoPro arrangements are still considered the best to experiment. The best compromise between cheaper cameras and the Google Jump is the Freedom 360. It’s a cubic rig that puts together 6 GoPro cameras and covers 360°. (It also comes submarine-style, if you’re feeling extra adventurous.) It only costs $400, and it’s compatible with Google Cardboard. If you want to explore other alternatives for HD 360° cameras you’ll find more choices here. Next Audio: Immersive storytelling means immersive sound. That means that, more than ever, you can’t have any flaws in your sound. We’ve (This we is for RAINDANCE.org, a London based Film Co-Op and a very cost-effective alternative Film Education Program founded by Elliot Grove) discussed it at lengths in our Nikon Short Film Toolkit, sound is one of the main things that can make or break your film. So make sure you’ve got amazing sound recording devices, and use these Cinema 2.0 Hacks. The joy of shooting of 360° also means that, if at all possible, you should make sure you get the sound right, that is make your sound as 360° as your visuals. And as with every other equipment, hide it well. Be prepared. Be prepared. Be prepared. There’s no other path to good directing. It’s grueling, and a massive amount of work, yes. There are things you can do such as breaking your script, and keeping everyone and everything in check. We’ve got a list. But since the experience is all about being immersive, create something to immerse your audience into: something vivid and poignant, something to experiment that goes beyond the mere use of the medium and doesn’t make it simply a gimmick. How many movies have been released in 3D since Avatar? And how many used it really well? Yup, that’s very few indeed. (And usually from the masters: Cameron, Scorsese, Spielberg, Wenders and that’s about it.) Avoid that pitfall with VR, but don’t let that get in the way of experimenting. But that does mean you can’t have any gear or equipment lying around, or lights in the face of your actor. Or the director can’t be anywhere in sight. Also, since you’ve familiarized yourself with the medium by now, you know you have to avoid unnecessary shakiness and nauseating motion. That means your rig has to be stabilized, or find a way for the actor wearing the camera to move in the smoothest way possible. In terms of visuals, bear in mind that you probably won’t be able to cut, zoom in, move in, get a close up and move back to a medium shot or any of these nifty editing tricks that we love in cinema, that are the basics of film grammar and that help us tell a story. That’s both the problem and the joy of VR: you’re handing the keys of the narrative to the viewer, but OMG you’re handing the keys of the narrative to the viewer. So how to draw attention to what needs to be seen? Is it by lighting one part of the room more brightly? Through the colour palette in the art direction? That’s for you to find out. Now, for my next post-blog let’s go to the editing room…. and then I will tell you SCRIPT-SCRIPT-SCRIPT and the 3 secrets to Writing the Great VR Screenplay. 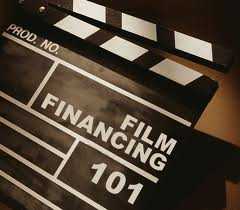 Bottom-Line budget $500, get a 3-page script, 1-room, 6 actors, 2 having a debate and the other 4 simultaneously reacting to the debate, rent a Rig for 1-day, figure out Audio and do a shoot. Voilla! You are now a “almost” a VR Pro that will be “almost” on panels at Sundance, Toronto & Cannes telling the next generation of wannabees how amazing the format is… now get ready “almost” for consulting gigs. well, keep upp the nice wwork fellows.